A team of scholars and students from the University of Helsinki, including members of the Centres of Excellence ‘Changes in Sacred Texts and Traditions’ and ‘Reason and Religious Recognition’, has participated in the excavations that have uncovered a partially-preserved colorful mosaic floor in the ancient synagogue at Horvat Kur (Israel) dating to the Byzantine period (4th—7th c. CE). 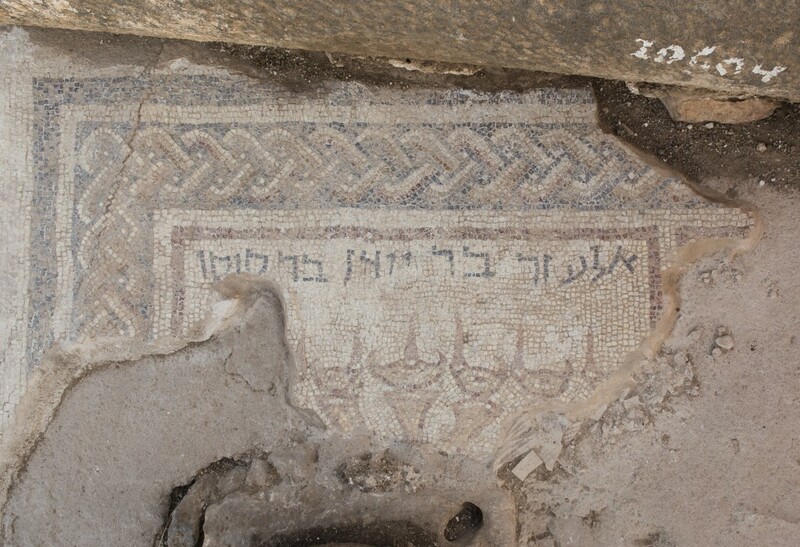 The newly found mosaic with a menorah and an inscription in the Horvat Kur synagogue (photograph: Jaakko Haapanen; copyright: Kinneret Regional Project). The exposed mosaic consists of a panel showing the upper part of a menorah, along with an inscription mentioning the name El’azar, as well as the names of his father and grandfather. The inscription on the mosaic names El’azar, his father Yudan, and his grandfather Susu or (possibly) Qoso. These men may have been influential members of the local Jewish community at Horvat Kur during the Byzantine period, i.e., between the 4th and 7th centuries CE. El’azar and his forebears perhaps helped pay for the construction of the synagogue and its mosaic floor. The menorah, a seven-branched lamp-stand, was one of the most important religious symbols in late ancient Judaism. Inscriptions mentioning persons who made donations to public buildings were also a prominent feature in ancient public buildings, including Jewish synagogues, Christian churches and pagan temples. But the specific combination of names in the Horvat Kur inscription has never been seen before. The menorah (pl., menoroth), a type of lampstand, had been prominent in the ancient Jewish temple in Jerusalem destroyed by the Romans in 70 CE. Later, during the Byzantine period, it became a popular symbol in Jewish synagogues, perhaps a sign that the synagogue was playing a more important role in Jewish community life. The mosaic at Horvat Kur confirms this general picture, yet also adds some new details. It depicts, for example, an oil lamp on each of the seven branches of the menorah. The lamps are accurate for the Byzantine period, and they are symmetrically arranged around the central lamp. The lamps face the center, with the flame on the side closer to the center. The central lamp has its wick and flame in the middle of the lamp, something that is unknown in the archaeological record. Future studies will examine more closely the peculiar form of this lamp. Unfortunately the menorah is not fully preserved, because a column base was later cut directly through the mosaic when the synagogue underwent renovations. 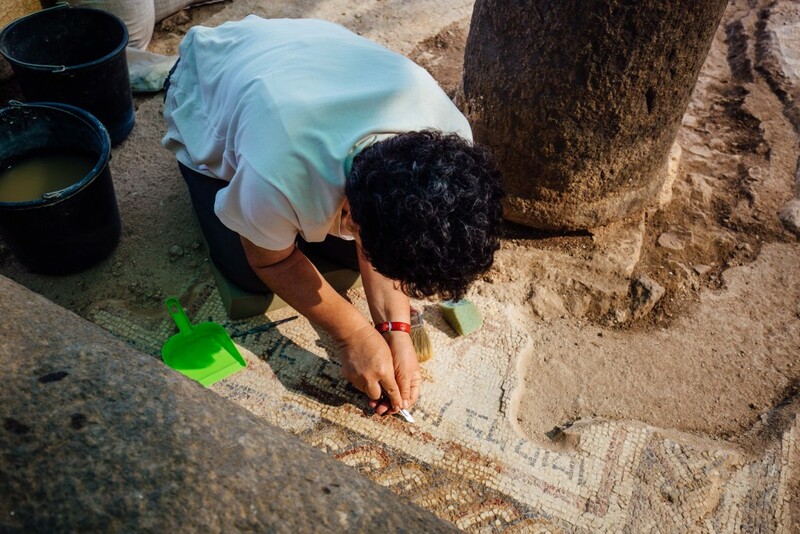 After the conclusion of this summer’s excavations, the mosaic was removed from the site and transferred to the Israel Museum laboratories for conservation and restoration. Aerial photograph of Horvat Kur (photograph: Griffin Aerial Imaging; copyright: Kinneret Regional Project). 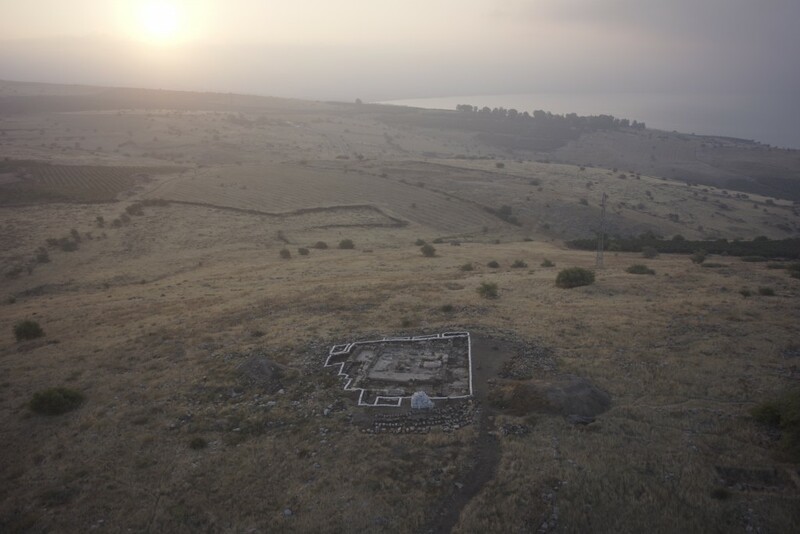 The 3ha-site of Horvat Kur is located on a hilltop a few kilometers off the north-western shore of the Sea of Galilee, in the vicinity of ancient Jewish towns such as Magdala and Capernaum. It is also close to important ancient Christian pilgrimage centers such as Tabgha. 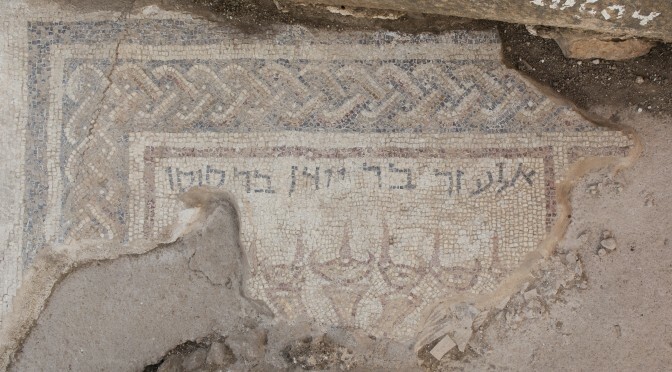 Along with a stone seat and a decorated stone table previously discovered at Horvat Kur, the mosaic adds valuable new data to an already vibrant study of a region that is crucial to ancient Jewish and Christian history and culture. Preliminary analysis of the finds at Horvat Kur indicates that Christian monasteries and surrounding Jewish villages had close economic connections. The finds also show that rural eastern Galilee was receiving imports from regions as far away as North Africa, the Black Sea, and southern and western Turkey. Since 2007, excavations on Horvat Kur are carried out under the auspices of Kinneret Regional Project, an international research consortium sponsored by University of Bern (Switzerland), University of Helsinki (Finland), Leiden University (The Netherlands) and Wofford College (USA). Co-directors and university representatives from the Kinneret Regional Project include: Dr. Jürgen Zangenberg (Leiden University), Dr. Raimo Hakola (University of Helsinki), Dr. Byron R. McCane (Wofford College) and Dr. Stefan Muenger (University of Bern). The staff members from the university of Helsinki include: Rick Bonnie, Ulla Tervahauta, Vilja Alanko, Sirpa Alaranta and Jaakko Haapanen. The volunteers from Helsinki were: Jeremy Penner, Jutta Jokiranta, Anni Kähkönen, Saimi Kautonen, Johanna Ketola, Samuli Tyni, Harri Söderholm, Kalle Jouppi, Jaana Rissanen, Jussi Ikkala and Saija Kainulainen. For further information see www.kinneret-excavations.org. 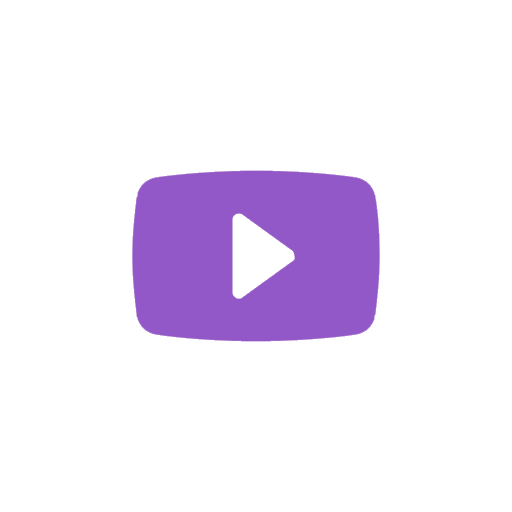 For a list of articles on this news that has appeared in the Finnish media, please see the CSTT media page.